This has been new things week. Not really new, of course, just new enough to be newly fascinating. The nights are getting chilly here in Southern California (mid 50s!) 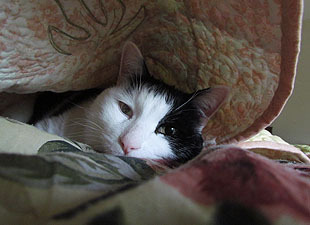 so Marian tossed an extra quilt on her side of the bed, and Inkblot instantly fell in love. Every day he hops up on the bed and burrows under it for his late morning nap. 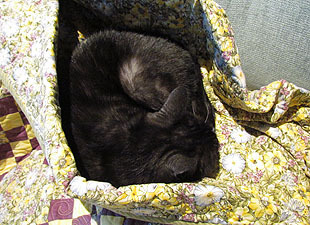 Likewise, I got a little chilly a few nights ago and grabbed a quilt, which I then tossed onto my chair after I was done. Domino, who has never shown any interest in this chair before, claimed it immediately. Yes, she’s the round black ball in the middle of the nest on the right. In other news, today is Beethoven’s birthday, so go listen to a symphony. Or, better yet, his violin concerto. And in case you’re a late riser and missed my fundraising pitch this morning, you still have a chance to contribute to the Mother Jones Investigative Fund today. This is our last beg of the year, and we’re trying to raise $75,000 to help fund our reporting activities for 2012. Many, many thanks to everyone who’s contributed so far, whether it’s $5 or $500. The PayPal link is here. The credit card link is here.